Following an Avengers incident in Nigeria with civilian casualties, the international community is no longer comfortable with a private organization of enhanced people acting with no official oversight. The United Nations presents the Avengers with the Sokovia Accords, which will officially place them under the supervision of a U.N. panel, deployed only when and if the panel deems it necessary. This splits the team, with some agreeing that checks are necessary and powerful groups like the Avengers should be subject to international law, and some feeling that they as individuals are more trustworthy and responsible than a political organization like the U.N. with its own agenda. Quickly their differing philosophies are put to the test when a U.N. building is apparently bombed by the Winter Soldier, Bucky Barnes. The U.N. task force calls for Barnes’s capture, but Captain America believes his old friend is innocent. Meanwhile, a man with nothing to lose plots to destroy the Avengers from within. The choreography and inventiveness to the fight scenes in Civil War are truly amazing. There are so many amazing little moments like Bucky using a stairway railing to swing down to a lower floor in the Bucharest fight, or Tony Stark using an Iron Man glove to block a point-blank bullet to the face at the U.N. building, or Wanda using her powers to send Captain America flying up thirty feet and into the action “like we practiced”. The full confrontation between Team Iron Man and Team Cap at the Leipzig Airport is probably the greatest super hero action scene ever filmed. It flows, it arcs, it gives every single character at least one (or several) Wow! moments, it illuminates character, it’s funny (“Hey buddy, I think you lost this!”), it’s scary (War Machine’s long powerless fall), it’s visually stunning, it’s brilliantly choreographed, and it’s perfectly thought-through. This entire review could be breaking down the “best parts” of just this sequence. All 12 of our super heroes are portrayed about perfectly. In just 20-minutes, this is already the best on-screen Spider-Man to date. Black Panther is awesome, and his character arc, from seeking vengeance to seeking justice, is the closest thing we get to a happy ending. Every moment with Ant-Man is gold, and his transformation to Giant-Man is an incredible climax to the big airport fight. Vision and Wanda are terrifyingly powerful and their burgeoning relationship, an “opposites attract” thing between the living embodiments of order and chaos, is fascinating. The jealous best-friend rivalry between Falcon and Winter Soldier is hilarious, and their little smirks when Cap kisses Agent 13 is probably the biggest laugh moment in the movie. The conflict between Iron Man and Captain America is so potent because both sides are right and both sides are wrong. Emotionally, I agree with Cap, because Bucky is innocent of the U.N. bombing and his moral culpability for his crimes as the Winter Soldier is at the very least up for debate, and I know and trust the Avengers to do the right thing without oversight. Rationally, I agree with Iron Man, because in the real world I certainly wouldn’t advocate a private military force going wherever they want and fighting whomever they deem worth fighting with no one to hold them in check, and I do believe the best way to influence the system is from within the system. On the other hand, Cap is always so positive he’s right that he’d rather fight than talk, and he has withheld his knowledge of what happened to Tony’s parents for a couple years now, and Tony is way more invested in deferring responsibility for the things he’s done (and may still do) than he is in true oversight and accountability, and illegally bringing a 15-year-old to Germany to help arrest Cap proves that. 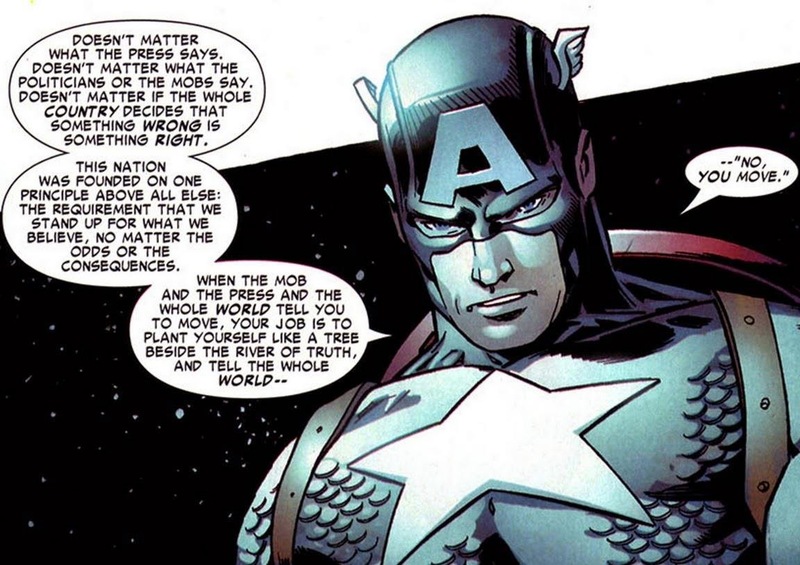 One of the most famous passages from the Civil War comic is Captain America’s “no, you move” speech. It’s a good speech, I suppose, but it comes off a little pig-headed to say the least. It was a brilliant move from the writers to give that speech to the ghost of Peggy Carter instead – especially if you watch her TV series, and you’re aware of all the times she’s had to refuse orders to do the right thing – and to start it with the following line: “Compromise where you can. Where you can’t, don’t.” It’s so much more powerful in this movie, and so much more nuanced and acceptable a philosophy. And it inspires Cap (and, humorously, Falcon) throughout the film, when he’s repeatedly told to “move” and stop protecting Bucky, and always refuses. This isn’t a flaw in the movie, because it’s not the story they were telling, but it loses a little for me that there isn’t really any scene of a super hero saving someone or putting themselves on the line for a stranger, which most of the Marvel Studios films include. They could’ve possibly inserted some small moment in the Lagos scene, but perhaps it would’ve taken away from the tragedy at the end. Agent 13 has a little more to do here than she did in Winter Soldier, but not enough for me. Her romance with Cap feels a bit rushed, and it could’ve diffused the slight ick-factor of her being related to Cap’s last known girlfriend if someone in-universe had commented on it. The “friendship” between Cap and Iron Man in the previous Avengers films has always been strained, and I think that undermines how emotionally devastating the final fight between them is supposed to be. You can justify Bucky going back in the ice a lot of ways, but it still feels like it’s mostly done for narrative convenience. I absolutely love Spider-Man in this movie, and thematically he totally works (the whole argument around the Accords is basically about power and responsibility), but on a plot-level it feels like he’s shoehorned in because it would be fun to have him. Black Widow’s exit from the narrative short-changes her character arc. Throughout all these movies her biggest concern is developing her own humanity, her feelings of self-worth, and her ability to connect with and be friends with other people, and after throwing her life with the Avengers away she just bops right out like it’s no biggie. Just another little moment for her could’ve tied it all together. The Raft seems a little overkill when 75% of their (four!) prisoners don’t even have super powers. It would’ve been great to see even one villain (the Abomination? Batroc?) in a background cameo. I couldn’t of put it any better for what I didn’t like about this movie. I do feel it is one of the best comic book movies ever. In my imaginary ranking this is five stars but out of my top 5.